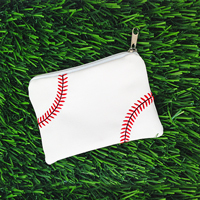 Display your love for baseball at your home or office all year! The Baseball Rose™ features petals handmade from genuine baseball leather, for a bloom that lasts forever. Our vase arrangement option is an attractive way to display Baseball Roses™ in the home or office. Choose to add 1, 3, or 6 handmade Baseball Roses™ to your vase arrangement starting at under $35. If you're looking for a special gift for a baseball player, fan, team mom, or coach, swing for the heart with the Baseball Rose™ vase arrangement. 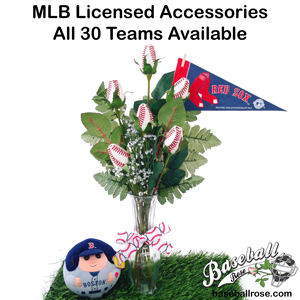 Baseball Roses­™ can be used for all occasions - birthdays, anniversaries, awards ceremonies, Mother's Day, Father's Day, Valentine's Day, and funerals. 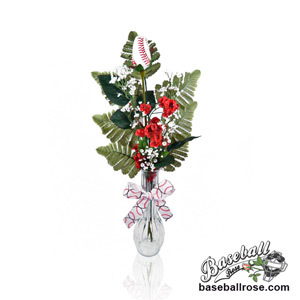 Use Baseball Rose™ vase arrangements as a centerpiece for baseball themed banquets or weddings. Custom Petal Message Imprint: We can add short permanent message to one of the rose petals (up to 15 characters in length). This is a great way to commemorate a special occasion like a player number, birthday, wedding date, tournament name, or special achievement. Custom messages will be printed in ALL CAPS with black print to improve visibility. If you choose the 3 or 6 rose vase arrangement, only the topmost rose will be customized. Contact us at 619-551-6651 if you would to customize more than 1 petal per rose or use a different color text print (additional charges may apply). Theme a Baseball Rose™ arrangement for your gift recipient's favorite major league baseball team by adding MLB Licensed Accessories. 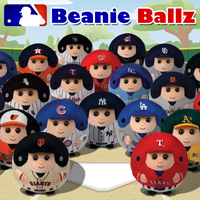 Mini felt pennants, Ty Beanie Ballz, Mini Foam Fingers, and more. 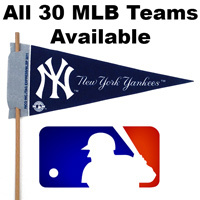 All 30 MLB teams are available. 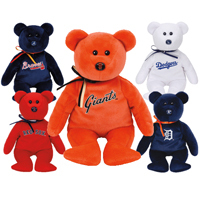 Your loved one will enjoy showing their team pride in the office or memorabilia display. Simply add your desired Baseball Rose™ Vase Arrangement to your shopping cart and then click here to pick your accessories. From Ricky of Glenview, Illinois on 2/23/2018 . Ordered for my die hard Baseball wife and she and co workers loved the detail and idea. Awesome . . .
Love everything about sports roses! From Corky Britton of Broken Arrow , Oklahoma on 12/27/2017 . I have bought some baseball roses in the past and have blessed others with this gift a few . . .
From Anonymous of Richmond , Virginia on 8/9/2017 . We actually had ordered a bunch of baseball roses for our wedding two years ago and a lot of . . .
From Penny Hearnen of Conde, South Dakota on 6/2/2017 . From Paula bauer of Portsmouth , Ohio on 2/27/2017 . Got this for a gift for a friend ! They loved it! 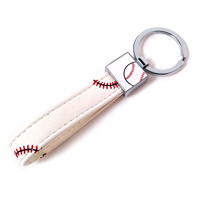 High-quality, durable keychain made from real baseball material. Theme your Baseball Rose arrangement for your favorite baseball team. 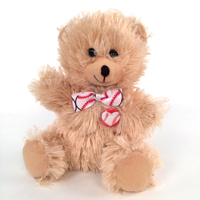 Add a cute and cuddly Beanie Ballz to your Baseball Rose gift. All 30 MLB teams available.